Very sleek large stroller. It is pretty big but just a bulkier version of the single Chico bravo stroller. My toddler sits comfortably in the back and looks at her baby sister in the car seat. Itâ€™s pretty durable and manoeuvres well. The only disadvantage is how bulky it is when transporting it but you canâ€™t really get a double stroller thatâ€™s comfortable when assembled to be easy transporting when collapsed. Iâ€™ll start by saying that this stroller is BIG. But thatâ€™s to be expected with a double stroller that can hold two infant carrier child seats. It is also very long, which can make maneuvering a bit of a challenge, especially in tight spaces. Turning radius is wide (and turning takes getting used to), yet in spite of all of those things, this is a great stroller. Setup is pretty quick and painless. This is a sturdy and nice looking stroller and I would highly recommend it to anyone who has two small children and needs a product like this, ESPECIALLY if they already have Chicco Keyfit seats. I registered for this stroller, without realizing how big the frame is, when I had a newborn and two year old. I loved the single Chicco KeyFitÃ‚Â® Caddy and was hoping for similar ease of use and versatility. Unfortunately, the Cortina's frame was so big and bulky that I could not fit it into the trunk of my Toyota Camry and so it became impractical to have as a primary stroller for visiting stores and parks. 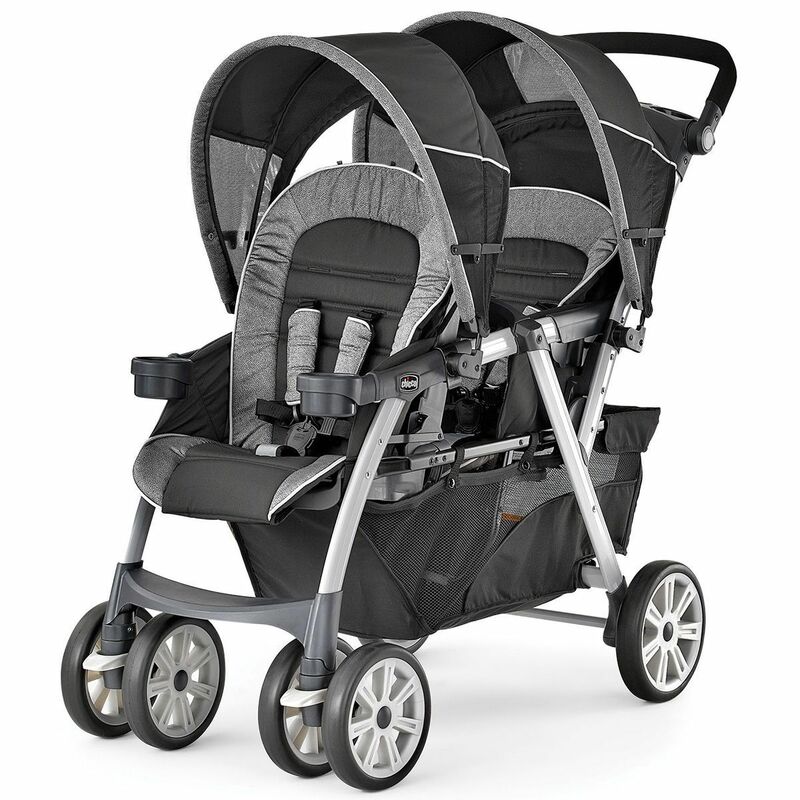 If you have much larger trunk space, you might find this stroller more useful.